ALBANY, New York -- New York will be the first state to make tuition at public colleges and universities free for middle-class students under a state budget approved by lawmakers Sunday. The plan crafted by Democratic Gov. Andrew Cuomo will apply to any New York student whose family has an annual income of $125,000 or less. To qualify the student would have to meet certain class load and grade point average restrictions, and room and board would not be covered. "College is today what high school was 50 years ago," Cuomo said on a radio interview Sunday on AM 970 in New York City. "If you're a young person who wants success and a career, a college education is necessary. The initiative is included in a $153 billion state budget proposal that passed the state Senate late Sunday after being endorsed by the Assembly a day earlier. The budget was due by April 1, but difficult negotiations delayed passage. The tuition plan will be phased in over three years, with families making $100,000 or less annually eligible in the fall of 2017, with the threshold rising to $125,000 in 2019. Cuomo's office says some 940,000 families will qualify. The initiative also includes $19 million for a new tuition award program for students at private colleges. The governor's office estimates that the program will cost the state $163 million. The budget approved Sunday also includes provisions allowing the ride-hailing apps Uber and Lyft to expand upstate and a juvenile justice reform known as 'raise the age' that would raise the age of adult criminal responsibility from 16 to 18. Additionally, the spending plan increases funding for schools by $1.1 billion, holds the line on taxes, sets aside $200 million to fight heroin and opioid addiction and invests $2.5 billion for water quality and upgrades to the state's aging water and sewer systems. 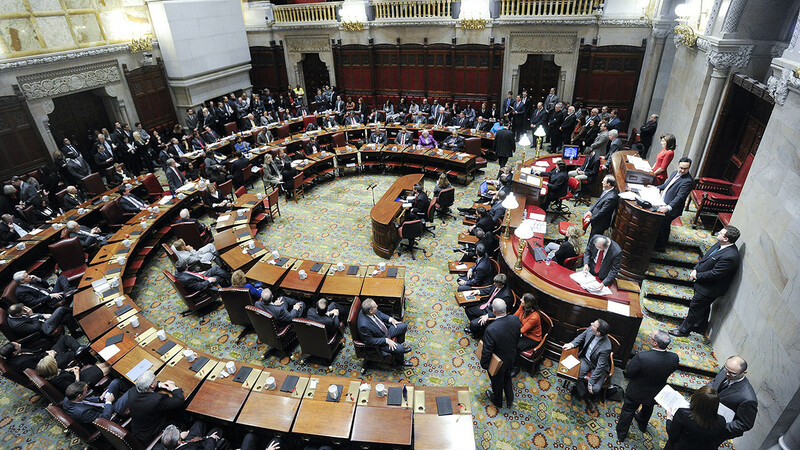 "That's a really, really good thing for the people of the state of New York and we got it done," said Senate Leader John Flanagan, R-Long Island. Raise the age emerged as a top priority for Assembly Speaker Carl Heastie and other Democrats and was one of the greatest sticking points for a budget. The agreement would raise the age slowly, to 17 in October 2018 and to 18 a year later, and would create new youth courts for felony offenses. Under the deal, young offenders would no longer be incarcerated in adult prisons and jails but would go to juvenile facilities where they could receive additional rehabilitation and treatment. Non-violent offenders could apply to have their criminal records sealed after a 10-year waiting period. Bronx Democratic Sen. Jamaal Bailey shot down opponents who have said the proposal gives teenagers a free pass and reiterated that it will instead allow youth who have made mistakes a chance at rehabilitation. "Ever been to a high school cafeteria? You're going to tell me that those are adults? That their brain development is the same as ours? No," Bailey said. Advocates say the measure will combat rampant recidivism in the youth criminal justice system because young people prosecuted as adults are 34 percent more likely to be re-arrested, often for crimes that are more serious than the initial offense. "This legislation will improve the lives of our youth, our families and our communities. It is also the best way to maintain public safety in New York," said Schuyler Center for Analysis and Advocacy policy director Dorothy Hill in a statement. After years of failed attempts, Uber and Lyft finally would be able to move into upstate cities such as Buffalo, Syracuse, Rochester and Albany. The ride-hailing apps have been limited to the New York City area but are expected to begin service upstate 90 days after the budget is approved. The expansion is a victory for many upstate leaders who said it was an embarrassment that the region was among the largest in the country without Uber and Lyft. "I am elated," said Republican Sen. Chris Jacobs of Buffalo.